Hipsters beware: That Postal Service button-down you wear ironically from your quirky hole-in-the-wall thrift store won't be so ironic come spring '14. 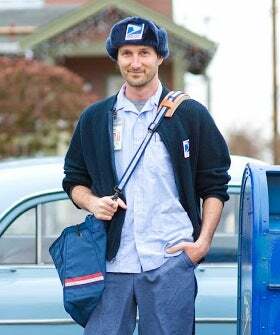 In an attempt to generate more revenue for the struggling agency, the USPS announced yesterday that they'll be releasing a men's fashion and accessories line next spring. With menswear company Wahconah Group, Inc. funding the entire project, the collection will skip out on the glitz of the NYFW runway and go straight to premier department stores instead. Strapped for cash, the USPS will receive a small percentage of the sales off of its appropriately titled Rain Heat & Snow line (sic on the missing comma, unfortunately). Before you get all cynical about the idea and go knocking it down, the project is promising to debut some seriously tricked-out gear. Think Uniqlo meets The North Face meets Apple. In a press release, Steven Mills, the Postal Service's licensing manager, said the goal of the line is to "produce Rain Heat & Snow apparel and accessories using technology to create 'smart apparel' — also known as wearable electronics." True to its unofficial motto, "Neither snow nor rain nor heat nor gloom of night strays these couriers..." (you remember it, right? ), the line will use sweat-wicking fabric and other all-weather materials. Footwear and a future womenswear line is also in the works.